The social web burn out blog is a documentary installation and a parody I made on the social web and networked experience. Not using a blogging service such as Blogspot but being the owner of a blog, the massive technological aspects of Web 2.0 emerge. Not only does the blog need maintenance, configuration and technical development, it also needs to incorporate numerous feeds and features from other social media such as Flickr, YouTube, GoogleAds for there to be even a hint of networked experience. The social, the commercial and the technological converge, setting the pace for Web 2.0. While Web 2.0 introduces increasingly interactive and user-generated stuff such as tagging (yes, I’m ironic here), its form is traditional, very traditional. 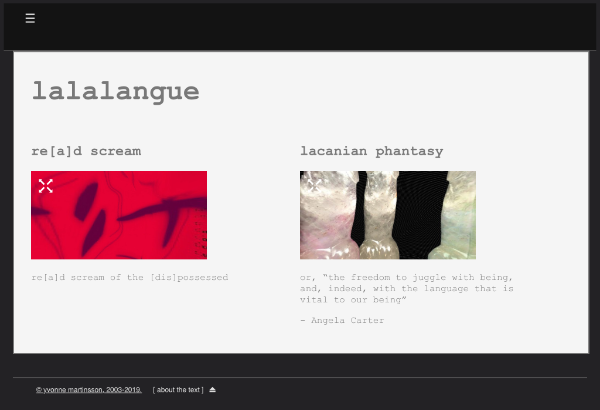 In Web 1.0 we saw an emergeance of hypermediac experimentation, mostly in artistic expressions. Today we have blogs and wikis for text, Flickr and others for photos, YouTube and others for video, MySpace for music. There is TV, there is radio, there is streaming of real life events. There is the real life duplicate in Second Life. There is nothing innovative about this. The web has turned into a distribution channel for traditional media forms. It is, in other words, a reification of the real.